Don’t forget to check out other interpretations of ‘foreign‘ here. It is! Did it all start in China I wonder? Can’t begin to tell you how much I missed good coffee in Japan. This green tea certainly looks much different that green tea in America to me! Certainly a nice submission to the weekly challenge. Thanks for sharing your photograph and story! …. strange combination, that’s for sure! No, the tea ceremony is so quintessentially Japanese that a tray of green tea, with its proper accompaniments is just perfect! Wow, I am so glad for your photo. The tea looks sweet and minty to me and the cookie is so gorgeous. I would love it. This makes a pretty presentation regardless of the taste! It looks so milky green. Beautiful photo. After the first bitter taste of tea, I would have stuck to the cookies. Our neighbors have had a few Japanese Foreign Exchange students who have brought *sweets* as gifts for their hosts. It always amazes me how un-sweet their treats are in comparison to ours! Me too. Some eats we bought that appeared sweet and sticky were quite tasteless and bland and in some cases very salty! We gave up the visual method of identifying food very soon 🙂 Thank you for your visit and comment. It’s such a pretty tea. Too bad the flavor didn’t quite match. Photogenic if nothing else 🙂 We kind of got used to the discrepancy between appearance and taste – or rather our expectation of taste – after a while. That is really green. I might have to think twice about trying that, but congrats on being brave and doing so. Bilious isn’t it? Wasn’t brave enough to finish it. I’m pretty game about trying new foods/drinks, but bitter is bitter. Not what I call a relaxing, soothing, comfortable to the palate drink. Good choice for foreign. At least you tried it- was a beautiful colorful presentation- right down to the matching painted cookie AND what an apropos picture! You had authentic Japanese tea. I have not , yet. It looks so beautiful for a bitter tasting tea! Must be a bummer. What were those delicate looking green leaf and flower things? i’m assuming cookies. That would have been a wise decision 🙂 That said I did enjoy their standard green tea, even the powdered version in sachets in our hotel rooms! …it does look bitter! Reminds me of the “fake” food we used to make out of clay [mud] when we were kids and paint it in various colors. Beautiful to look at! All their food is beautiful Marina. Sometimes more beautiful to look at than to taste 🙂 Prep. should take an enormous amount of time!! The presentation of the tea is beautiful. Drinking it must have been quite a surprise 🙂 Great interpretation of the theme! I enjoy green tea but if it was that bitter I would be surprised too. 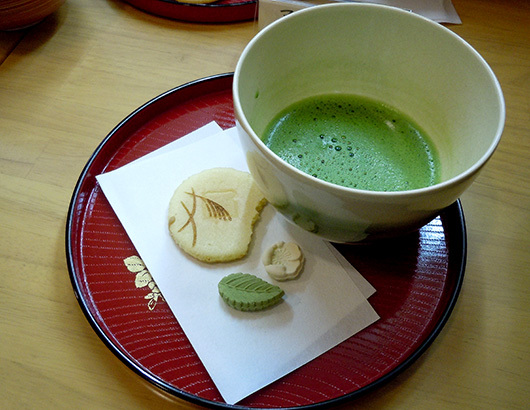 The colors on the traditional Japanese plate and the green tea color are very eye appealing. Agreed on the vending machines. Soupy tea??? That’s the first I hear of it…. bitter things are supposed to be healthy, what are the health benefits of this one? Another green tea post! (Travel with Kat). I like green tea but I’m not sure about this one – definitely very foreign…. Very interesting. The painted cookie is gorgeous! I just love their attention to presentation and making things look nice. Almost everything I bought in Japan was nicely wrapped after I paid for them. It does look foreign yet irresistible. I am drawn what is unique and mysterious. You bet, I will try one if I see it.